Can I add you guys to my network? Of course! We’d love to connect with you. There’s no way you have a Google+ profile too? I’ve noticed something wrong – how do I contact you about a bug? Don’t be shy – we’d love to hear it! Drop us a line at [email protected]. We all like to see who we are talking to, so please add a picture and let other members put a face to the name. 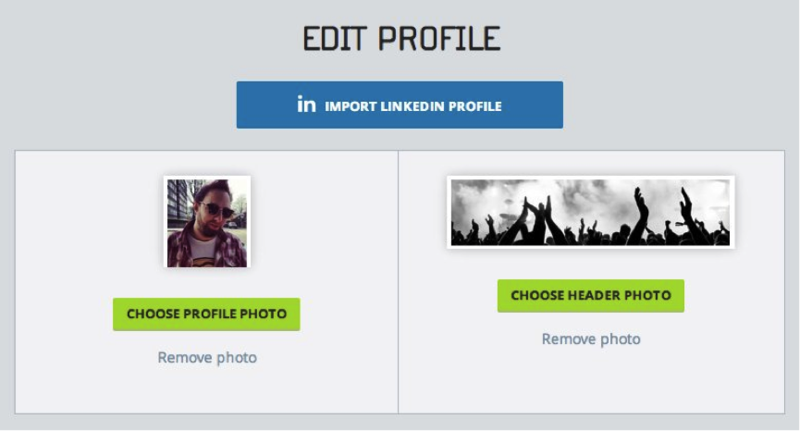 Visit your profile page and click on ‘Edit Profile’, then it’s just a case of selecting ‘Choose profile photo’ to browse your hard drive and add your photo. You don’t need to worry about uploading the wrong size; you’ll be able to crop your image before you save any changes. On the ‘Edit Profile’ screen just tap the ‘Choose header photo’ button to select your header image of choice. Want to show off which Procurement & Supply Chain memberships you hold? 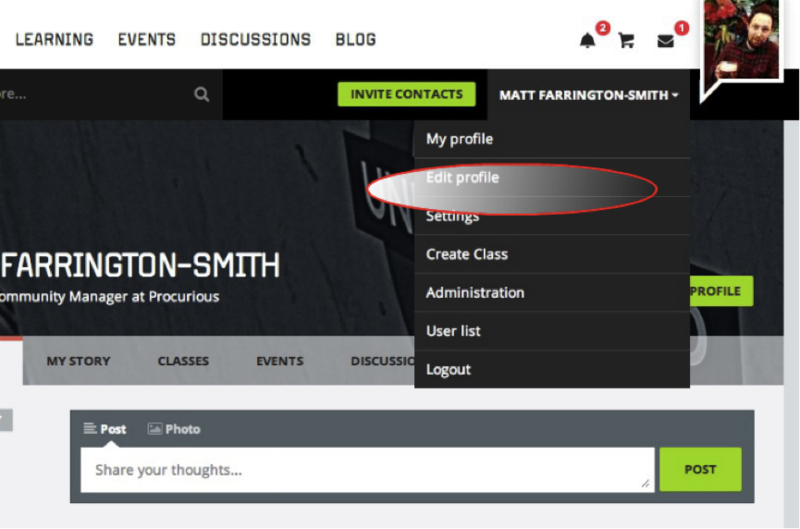 Just click the dropdown under ‘Memberships’ and select any memberships that you hold. 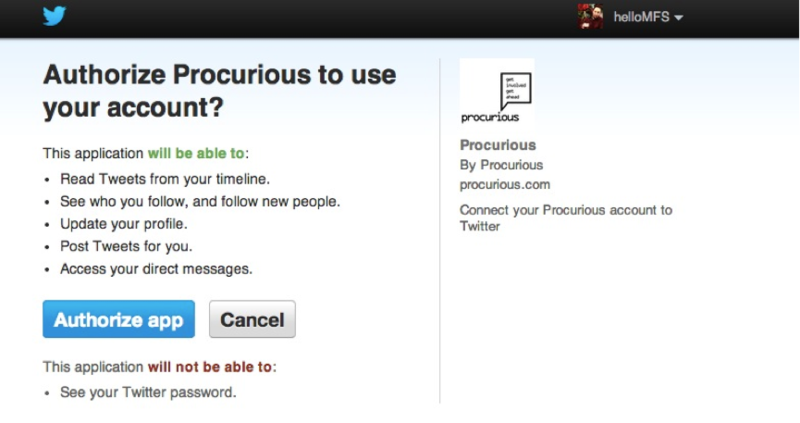 Why is Procurious asking me for permissions? When you connect another social network up to your Procurious account you’ll be prompted to confirm you’re happy with Procurious accessing your details. Don’t worry this is standard procedure; there’s nothing creepy going on! While we do have access to your invitations and messages, it is completely blind as LinkedIn would never allow anybody to physically read your messages. The permissions we ask for are simply to import your information in to your Procurious profile. When you created your Procurious account, you had the option of connecting your LinkedIn account. If you chose not to do this it’s OK, you can still do it now. Open up the drop-down menu next to your name. Select ‘My profile’ from the list. Alternatively, click on your profile image and press the ‘Edit profile’ button. How do I connect Facebook/Twitter to my account? If you want to share your Procurious activity with other networks, you can connect Facebook and Twitter via your Profile page. 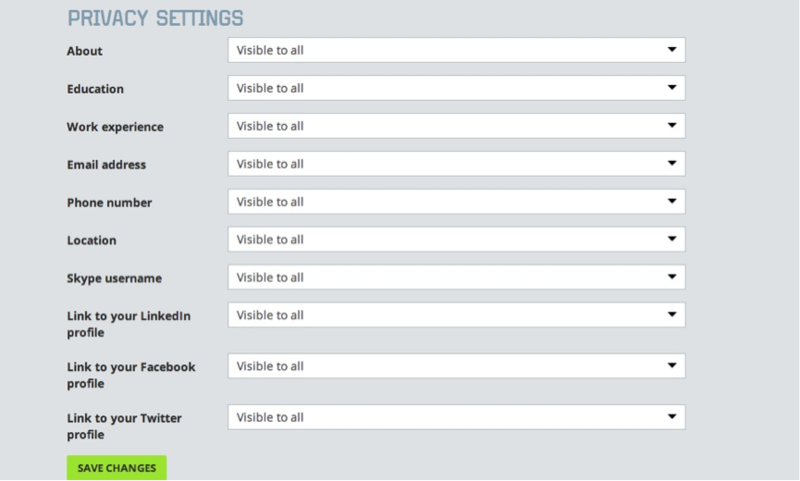 Select the social network of your choosing and click the corresponding ‘Connect with…’ button. You’ll be prompted to authenticate (and give permission) to Procurious to access your account, just confirm this is all OK to complete. Procurious is asking to authorise my Twitter account. Why? You need to connect Procurious to Twitter so we can display your data. We don’t store your account details or data on our servers, it’s all safe and secure. How do I change my Procurious password? To get at your password details, select the ‘Settings’ menu by clicking on the drop-down next to your name. You’ll need to type in your existing Procurious password, but then it’s just a case of entering a brand new, secure password. Confirm by retyping it in the box below. When you’re happy just hit ‘Save changes’. Remember to use this new password the next time you log into Procurious. If you want to lock your Procurious profile down a little, then ‘Privacy settings’ is where you’ll do it. Here you can choose which details you want to show off to the world (or just other Procurious members in your network). Obviously, with this being a social network (and a place to make meaningful connections), we encourage you to be as open as possible – but understand if you want to be a bit more guarded. Control privacy settings for your professional details, as well as contact methods and social networking info by using the drop-down menus. Hit the ‘Save changes’ button when done. To really get the most from the network you’ll need some buddies to share the experience with you. 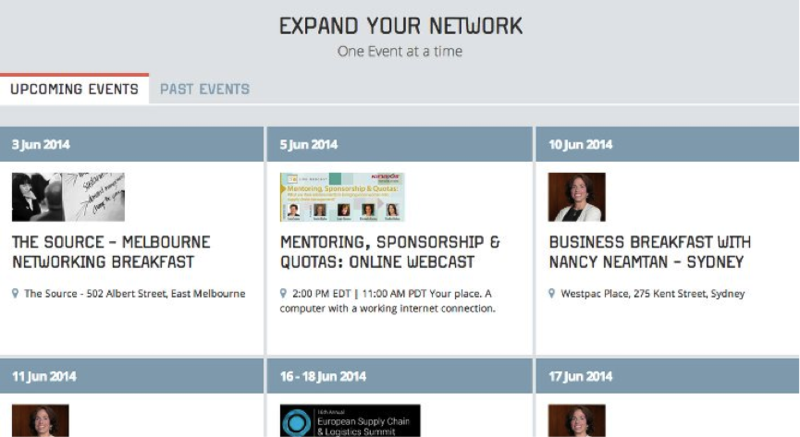 Fortunately we’ve made this easy: just click on the green ’Build Your Network’ button. Here you can see a list of every registered Procurious user, and choose who you want to add to your network. You search for other Procurious members by name, or filter by Country, Industry, and Category. 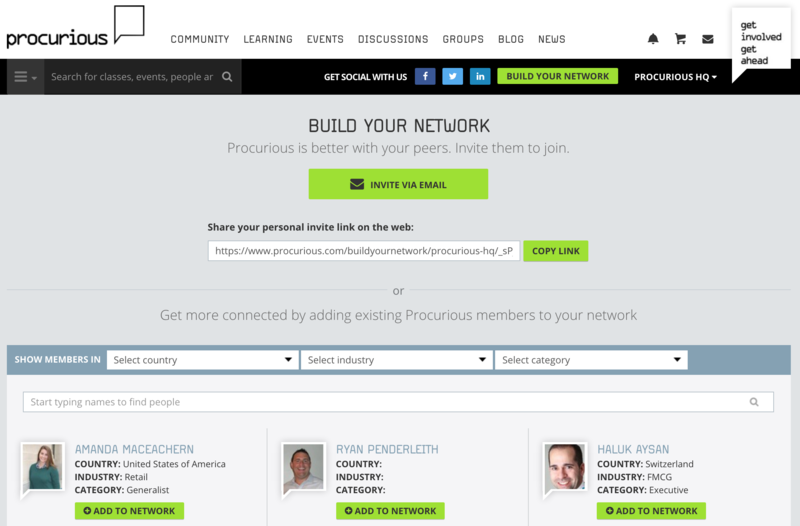 How do I search the entire Procurious network? You can perform a search from anywhere on Procurious. Just place your cursor in the search box – type your search term, and hit the Enter key (or click the magnifying glass). You can specify whether you want to carry out a site-wide search (all), or be a little more selective with your net. 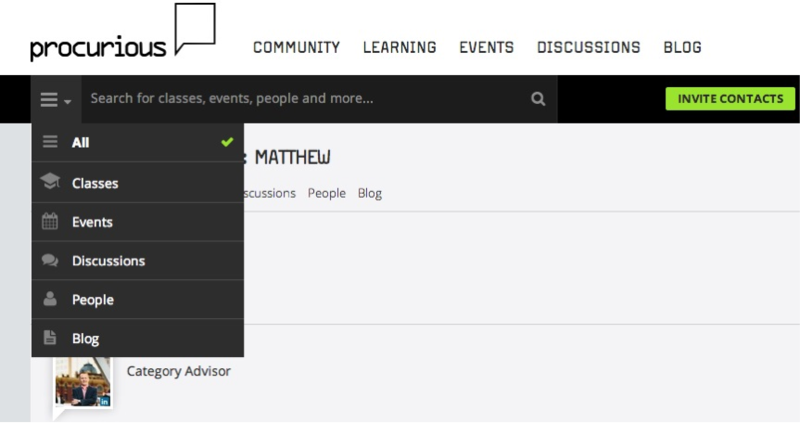 Choose from Classes, Events, Discussions, People, and Blog. If you’ve had a falling-out, or forgotten why you added someone in the first place, you can always remove them from your Procurious network. From your Profile page click on ‘View all’ below your My Network area. Here you are free to cast members from your network. Hovering your cursor over their name will cause the ‘In your network’ message to switch to ‘Remove from network’. Just select this to do the deed. Procurious includes a growing database of events that cater to the needs of the procurement profession. Check out the Events page by clicking the link on the main navigation. From here you can RSVP, leave comments, see the event twitter feed, and visit the official event website to book your place. Great news! You can add your event to the Procurious Event Directory by clicking on the ‘Add Your Event’ tile on this page. Once you’ve done that, it’s simply a matter of entering the relevant event details, clicking submit, and then paying the listing fee (US$400). Contact us if you’d like your event to be ‘featured’ as the top listing on the events page. How do I watch a training video? Head on over to the ‘Learning’ page and check out the videos on offer. Each video offers a bite-size preview, so you can decide beforehand if you think you’ll enjoy the content within. Like what you see? Then it’s simply a case of clicking the ‘Add this class to cart’ button – remember, you won’t be charged a dollar/pound/yen/dirham. Groups are the perfect haven for hanging out with likeminded professionals – each have been created around a core theme, so the key here is to join the ones that take your fancy. It’s easy as pie to join a Group. Just navigate to the ‘Groups’ page by following the link (it’s nestled between the Discussions and Blog items), and choose a Group from the list that takes your fancy. Depending on the membership options set by the Group owner you may have to wait a short while for them to approve your request to join. Procurious supports the following desktop browsers and all updated smartphone browsers. If you are having a problem with your particular browser, please don’t hesitate to get in touch.